Sunday I got invited by Bill Seals, his wife Erika and their 5 year old son Connor to go down to Kansas City to see the game with the A’s. I gladly accepted and had a great time. The Seals family are A’s fans and they were all sporting their “gear.” Bill wearing his Mark Mulder jersey, Erika an A’s t-shirt and Connor his Yoenis Cespedes jersey. I of course, being the Royals fan, wore my KC hat. The Royals won the game 2-0, which was fun for me, but really wasn’t the story of our daylong trip down and back from Des Moines. 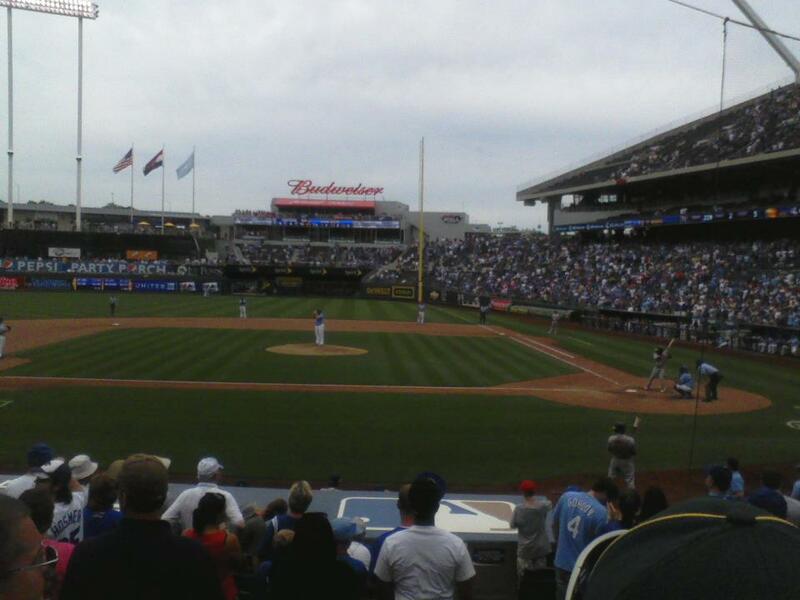 We got to Kauffman Stadium before 11:30 when the gates opened for the 1:10 first pitch. The A’s were taking BP (batting practice) when we walked in. I followed the Seals family down behind the A’s dugout. Immediately Connor began to yell out the A’s players by their first name. They all waved back in acknowledgement. The fact that this 5 year old recognized them and knew their names was neat. Before the game catcher Josh Donaldson saw Connor and told him that he remembered him from coming to Des Moines (AAA Iowa Cubs) last year when he was with AAA Sacramento. He also told him to stop by after the game. So after KC finished their at bat in the bottom of the 8th inning, we all made the trek back from our seats down the 1st base line to behind the A’s dugout on the 3rd base side. We all took a few open seats to wait for the game to end. Jamile Weeks makes the final out, grounding back to the mound. Jonathan Broxton tosses to Eric Hosmer. Game over. Royals win. Bill, Erika and Connor then walk down closer behind the dugout and wait for Josh. Turns out he popped his head out first looking for Connor! Their eyes meet and Josh tells Connor to wait a for a second. Minutes later Josh comes back and tosses up an autographed baseball. Impressive as that was, consider Donaldson is hitting around .150 on the season. Despite that, he had a smile on his face after the game when he greeted Connor. I became an instant fan of his. Fun day at “The K” and now have respect for the Oakland A’s players who made a 5 year old’s day by just waving and saying hello. 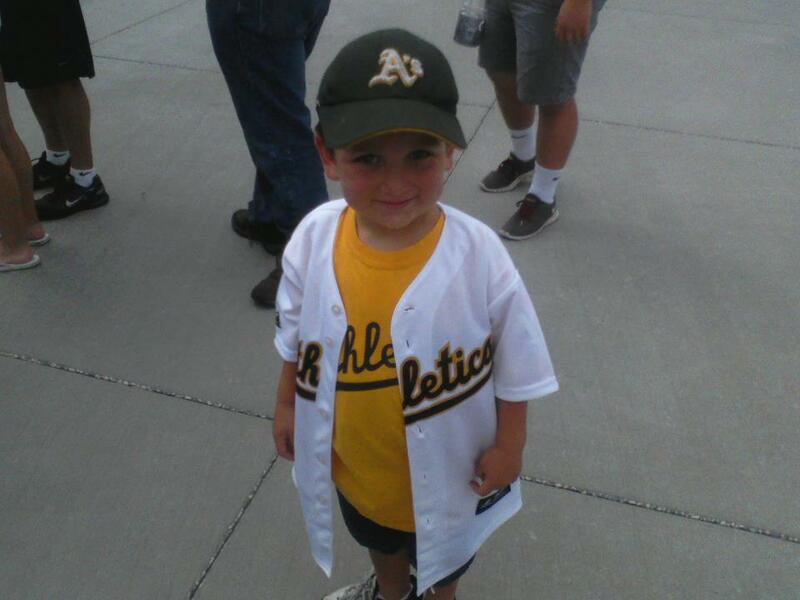 5 year old Oakland A’s fan Connor Seals in his Yoenis Cespedes jersey. Waiting for the game to end.